Silom Road Bangkok is a great place to explore just beyond the usual popular sights of the city. Great food, accommodation and attractions can be found along this busy 2 km stretch running from Lumphini park, westwards towards the Chao Phraya River. There are so many things to do in Bangkok! 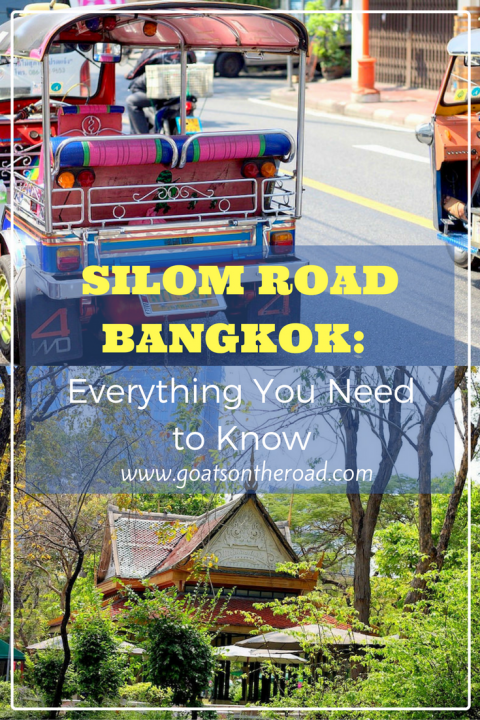 We spent over 3 weeks using Silom Road area as our base in Bangkok and explored it thoroughly at all times of the day and night. 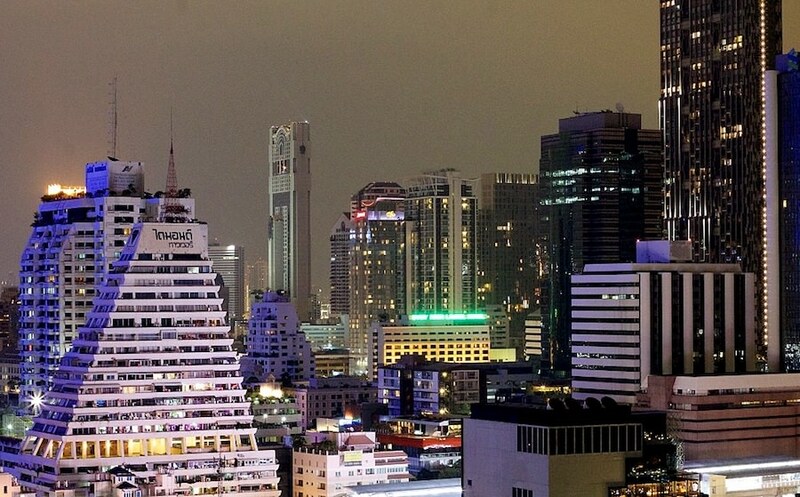 There are numerous amazing places to visit in Thailand, and Bangkok is definitely one of them. Here are some of our top places to see, shop, eat, relax and sleep along Silom Road. Towards the eastern end of Silom Road, at the junction Pan Road, stands an impressive Hindu temple known locally as Wat Khaek, simply meaning Indian Temple in Thai. 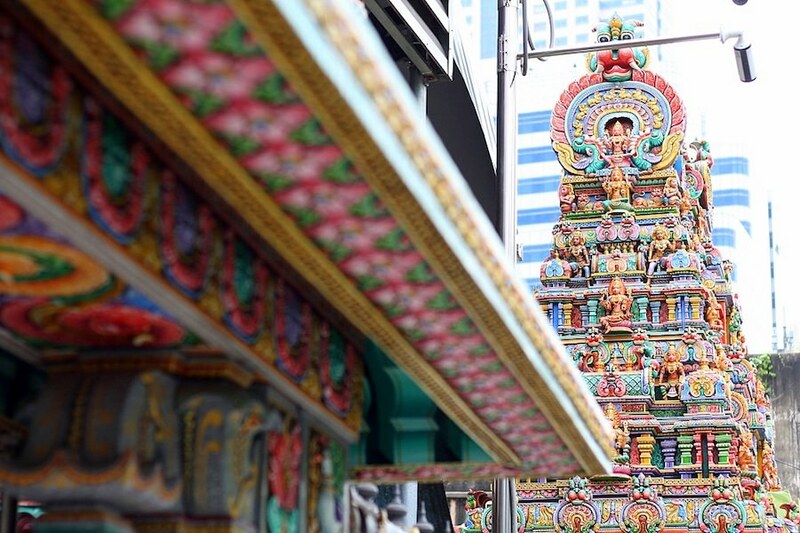 Displaying a South Indian style of architecture, the temple is an explosion of colour, smells and sounds. The temple features many carvings of varying gods and goddesses on both the outside and inside with several beautifully decorated shrines found within the temple complex. Just outside the entrance you’ll find several stalls selling colourful garlands, flowers, postcards, music, incense and coconuts to worshipers. The daily worships are well attended by a devoted crowd including local Thai Buddhist and Chinese alongside the local Hindu community. Alongside the sleazy ‘go-go’ bars and dubious entertainments on offer in the Patpong area you’ll find an extensive night market. The unusual location just adds to the slight illegal feel of this very popular market where you’ll find everything from cheap touristy t-shirts to knock off tech. 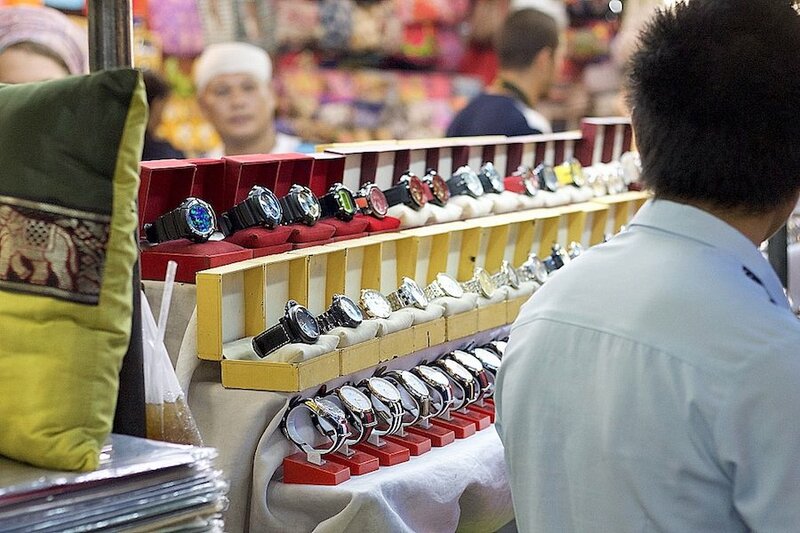 Great if you want to grab some last-minute Thailand travel essentials. If you’re heading in to explore the market be sure to keep an eye on your bag and valuables at all times and remember to bargain hard. Prices here will be much higher due to the amount of tourists passing through so don’t expect to find too many deals on offer. At the far eastern end of the Silom Road is the expansive Lumphini Park, one of the largest in central Bangkok spanning 142 acres. 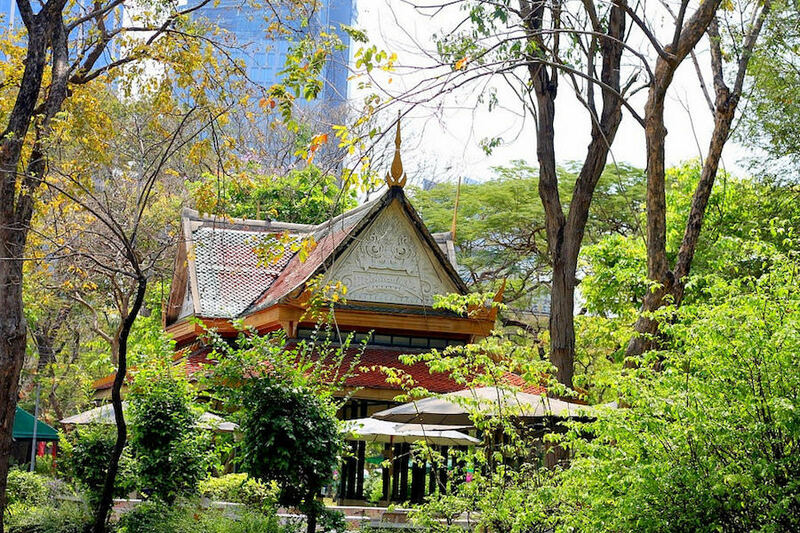 This welcome green space in central Bangkok was created by King Rama VI in the 1920’s using royal land and his statue stands at the southwest entrance. 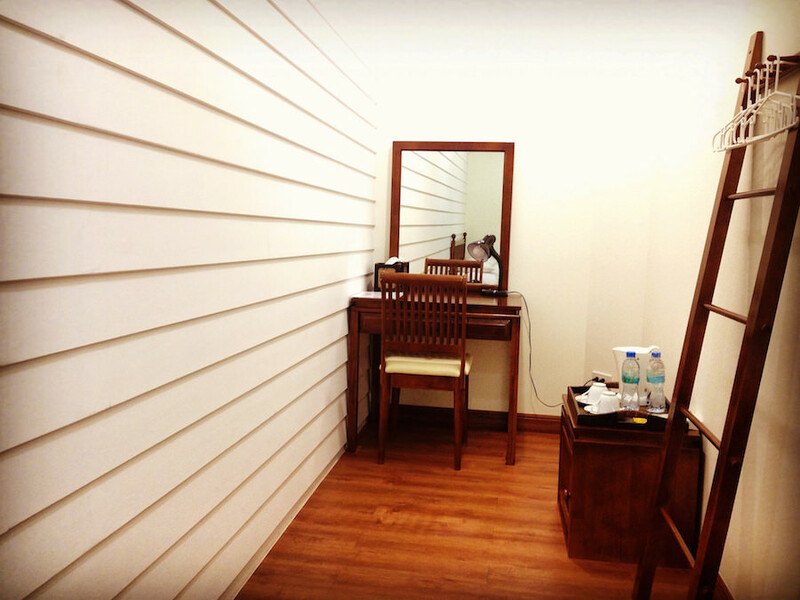 Here you can relax and unwind away from the crazy traffic and rush of the surrounding streets. You’ll see people practicing Tai Chi, jogging or cycling along the 2.5 km of paths or just chilling out by one of the manmade lakes within the park. 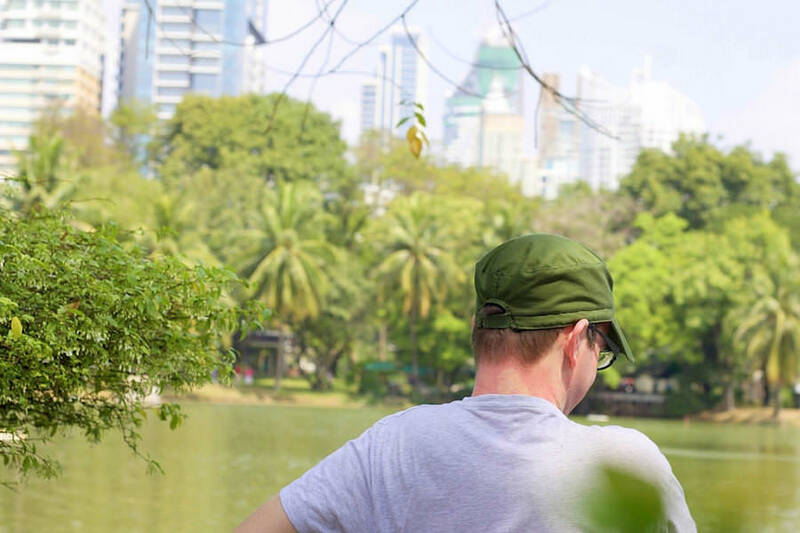 This is one of the best things to do in Bangkok if you’re looking for some peace and quiet. See if you can spot some of the famous iguanas who live in the lake, gratefully accepting any leftovers from picnic takers that might come their way. For this reason dogs are banned from the park and to keep the air fresh smoking is illegal here too. Made famous by the movie The Hangover: Part 2, the Sky Bar on the 63rd floor of the Lebua State Tower is the top spot in Bangkok to hang out and admire the stunning views across the city of an evening. The bar is open from 6pm until 1am daily and prices start from 320 Baht ($9.20 USD) for a small beer but at least there’s no admission charge. The dress code here is smart casual, so no flip-flops, beach sandals, gym gear or ripped clothing allowed. It’s also worth knowing that luggage and large shopping bags are not permitted here and there’s no where to store them so remember to travel lightly. Wherever you go in Bangkok you’re never more than a few meters away from some delicious street food and this is certainly true along the Silom road. 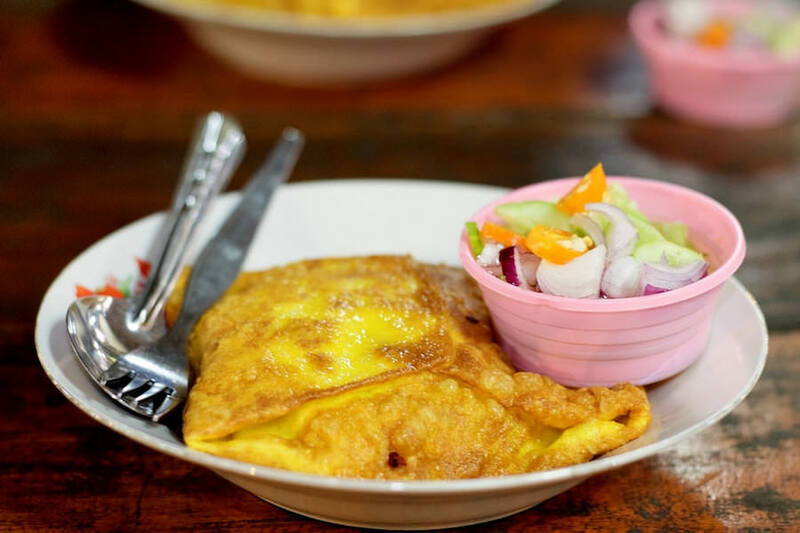 One of our favourite spots for tasty treats is hidden away down an alleyway, as all the best places are, 1 street east of Soi Silom 3 beside the United Centre building. There’s also cheap eats to be found along Soi Silom 20, directly opposite the Hindu Temple where you can grab some tasty Pad Thai for 50 THB. 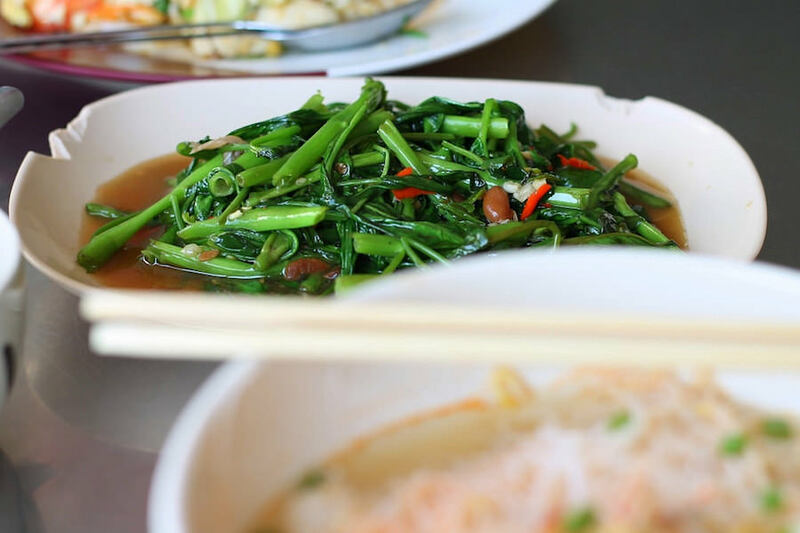 Equally head to Convent Road during the day for a good selection of local dishes along the wall of the Convent grounds, plus there are some great coffee shops here just away from the main drag. Note that Monday is usually the day off for street vendors so plan ahead to avoid getting hungry. There’s also a fantastic selection of restaurants in the Silom Road area if you fancy some cooling AC. One of our favourites was a Lebanese restaurant called Nadimos which serves a delicious selection of hot and cold mezes and delicious grilled meats with prices starting at 140 THB ($4 USD). With all that shopping and sightseeing you might be in need of a little pampering. 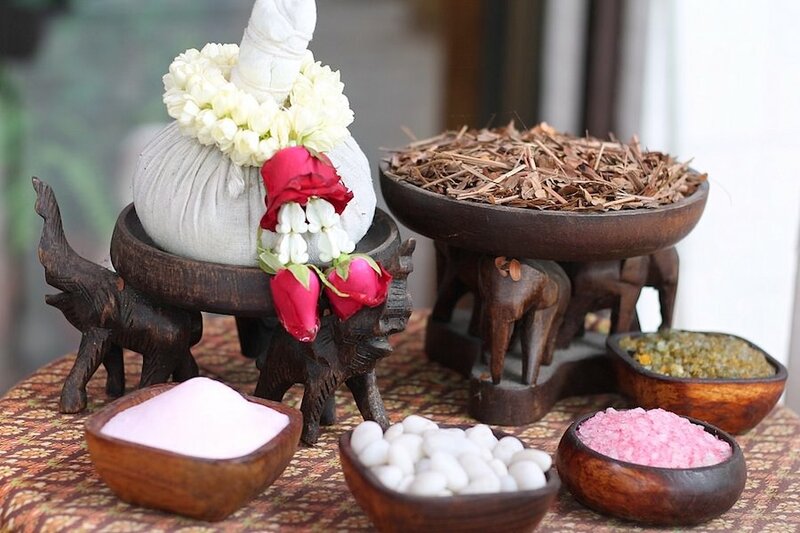 We asked around and did some research before choosing the Dahra Beauty and Spa at 154 Silom Road to experience a traditional Thai massage. There are many massage spots in the area but we were advised to avoid the ones where groups of ladies are sitting around outside, encouraging you in. We found the experience very professional and calming with some hot tea on arrival and fresh pyjamas provided to change into. Prices start from 500 THB ($14 USD) for a 1 hour Thai massage and we’d happily recommend it for an authentic local experience. We were also advised by a local that Ruen Nuad Massage Studio on Convent Road is also great for a foot, back, shoulder or full body massage and the prices and approach look to be similar. There’s no shortage of fantastic accommodation near the Silom Road to suit all budgets and tastes. We found a couple of friendly boutique style hostels at reasonable rates and close to all the local amenities. Check out the excellent Cooper Bangkok hostel just off Pan Road for a friendly welcome and a clean and quiet stay. The host, May, will make you feel right at home and the price includes a buffet style breakfast. Prices start at 450 THB ($13 USD) for a dorm bed and from 750 THB ($22 USD) for a private twin room. Close to Sala Daeng BTS you’ll find Silom Bird House, another great hostel choice with dorm beds from 350 THB ($10 USD) and a standard room with a shared bathroom from 800 THB ($23 USD) per night. There are good transport links in the area with Sala Daeng BTS and Si Lom MRT (Metro) stations both connecting at the eastern end of the Silom Road. Saphan Taksin BTS station is just one street south if you need to reach the western end of the area. 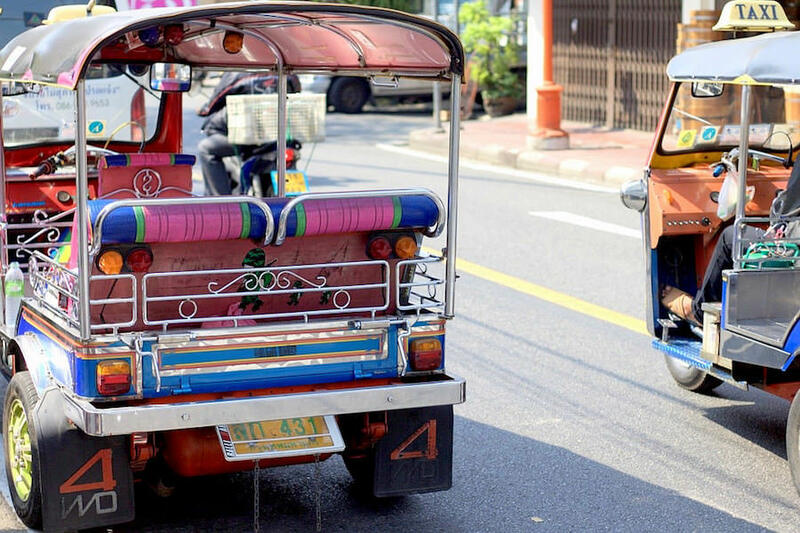 Just like anywhere in Bangkok there’s a constant stream of Taxis and tuk tuks along the main road if you need one. When heading back to the hostel we found that they all knew where the Hindu Temple was if I showed the driver the name in Thai on Google Maps. Just be aware that drivers might try to take you to Patpong for a bit of entertainment to earn some commission, politely decline and you’ll be okay. Also, just a few minutes walk from the western end of Silom Road is Sathorn (Taksin) pier. 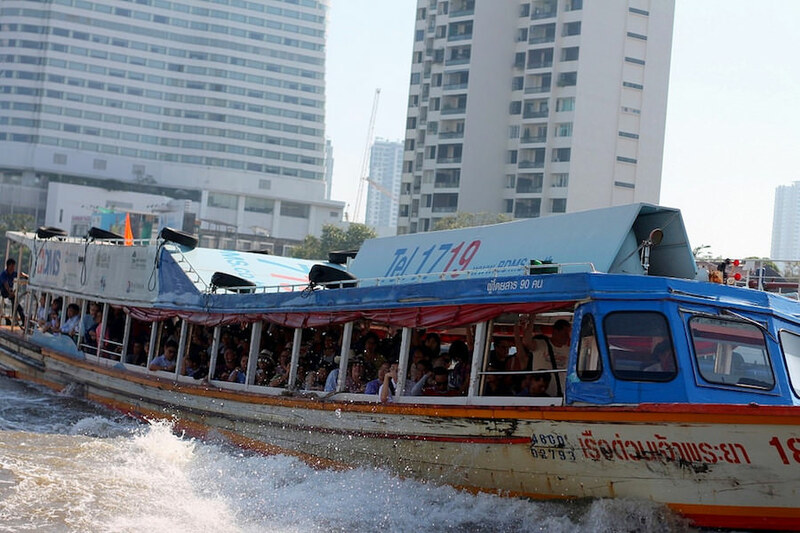 Great for super cheap and speedy tail boats towards the Grand Palace, Chinatown and Khao San Road areas. For more information, check out the Ultimate Guide to Backpacking Thailand!